Our redesign of moma.org started in the spring of 2015 with five insights from Google Analytics. 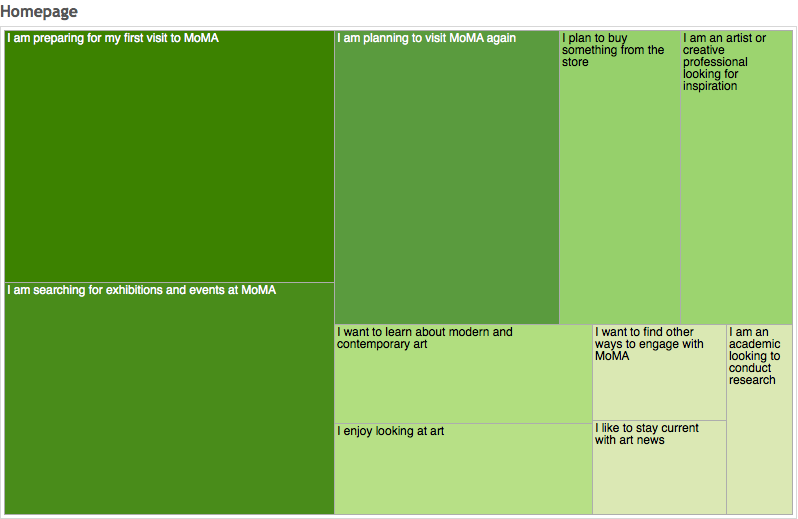 Our audience is younger than we realized: More than half of visitors to moma.org are aged 18–34. They are increasingly mobile: Almost 30% of our visitors access the website from a mobile or tablet device. Our online audience is more local than international, which is the inverse of what we see at our 53rd Street building. Our collection is our core asset, both on- and off-line: It attracts almost 30% of engaged views and it’s what most visitors have searched for. Every piece of content is the homepage: With the dominance of search, and rise of social media, the MoMA homepage is less critical to discovery and navigation. Today, only a quarter of our visitors arrive at our website via the homepage. The Tate went further, developing a segmentation of the different types of website visits based primarily on the motivations that drive users to the site, but also taking into account variables such as knowledge of art, vocational connection, and online behavior. Elena Villaespesa and John Stack wrote about this segmentation in detail in a conference paper, Finding the motivation behind a click: Definition and implementation of a website audience segmentation. Art world start-up Artsy also organized its segmentation along a vector of art knowledge (plus one of commercial interest), identifying its main audience segments as scholars, art world professionals, students, teachers, and art enthusiasts. We are running the survey quarterly across all sections of the website. It’s important to limit the survey to one question in order to get a large and representative sample of responses. We run the survey for two weeks at a time and get 25–40,000 responses each time. 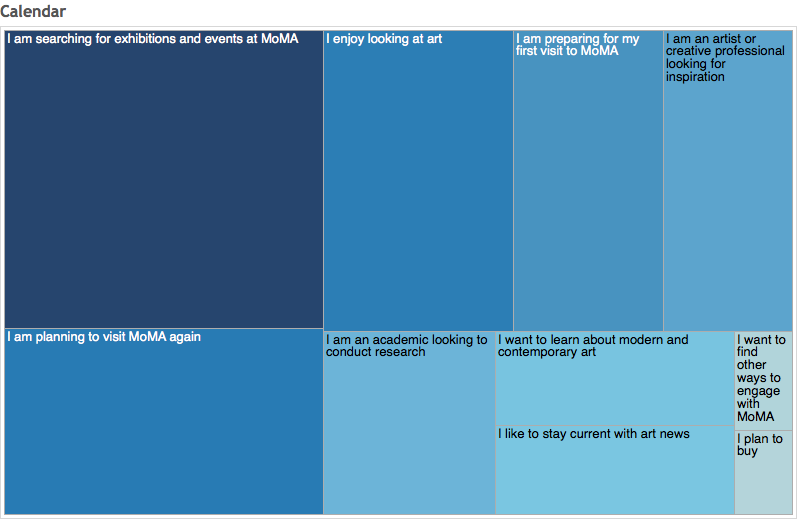 However, we also wanted to enrich this data with some demographic detail and understand our visitors’ level of art knowledge and involvement with MoMA. We did this by inserting the same question about website motivations into the 360°. This allowed us to characterize each of our motivation categories by demographics, level of art knowledge, and involvement with MoMA. Demographic: gender, age, education, income, race, and region. Level of art knowledge: knowledge of art in general, frequency of visits to art museums, other art activity participation, and profession (e.g. creative professionals). Involvement with MoMA: membership status, participation in Free Friday Nights, MoMA PS1, retail, education, and PopRally. 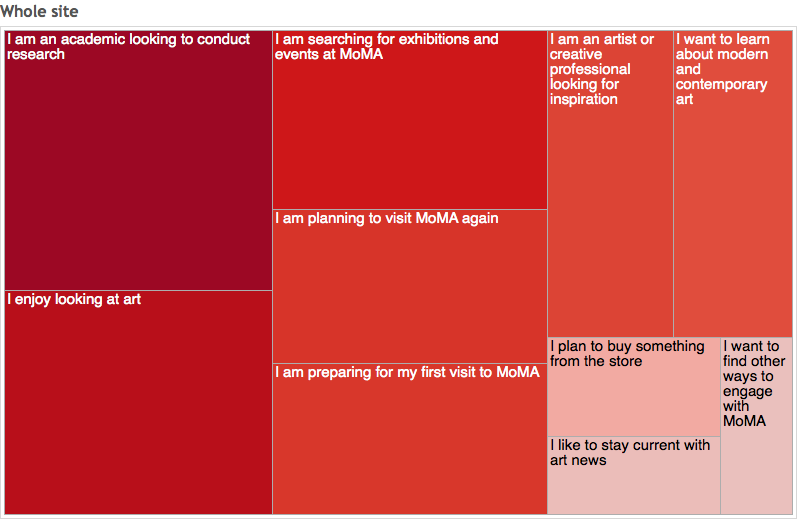 There is some seasonal variation in the order but the top three motivations for moma.org as a whole are consistently: I enjoy looking at art; I am an academic looking to conduct research; and I am searching for exhibitions and events at MoMA. Each time we run the survey, about 10% of our audience is made up of “artists or creative professionals looking for inspiration”, and another 10% “want to learn about modern and contemporary art”. The motivations obviously change depending on the section of the website. Learning is a much more significant motivation for visitors to the collection than elsewhere, closely following “research” (1) and “looking at art” (2). Collection visitors are also more likely to be an “artist or creative professional looking for inspiration” (4) and are the only visitors that have an interest in “staying current with art news” (5). People using the calendar are visit-focused but tend to be looking for a specific event or exhibition (1), or planning a repeat visit (2). They “enjoy looking at art” (3) and are seeking “inspiration” (5). People looking at the homepage are visit-focused, with a greater likelihood to be first-time visitors. They are still interested in specific event and exhibition information (1), and “enjoy looking at art” (4). They have a much higher propensity to shop than visitors to other sections (5), particularly during the holiday season. Linking the motivations to our 360° yielded a richer portrait of our web visitors. For example, those with aesthetic motivations (“enjoy looking at art”) tend to work in the arts, visual arts, architecture, and engineering professions, and report a medium level of art knowledge. Practitioners “looking for inspiration” report a lower level of art knowledge. People preparing for their first visit tend to be international and younger, and also report a low level of art knowledge. 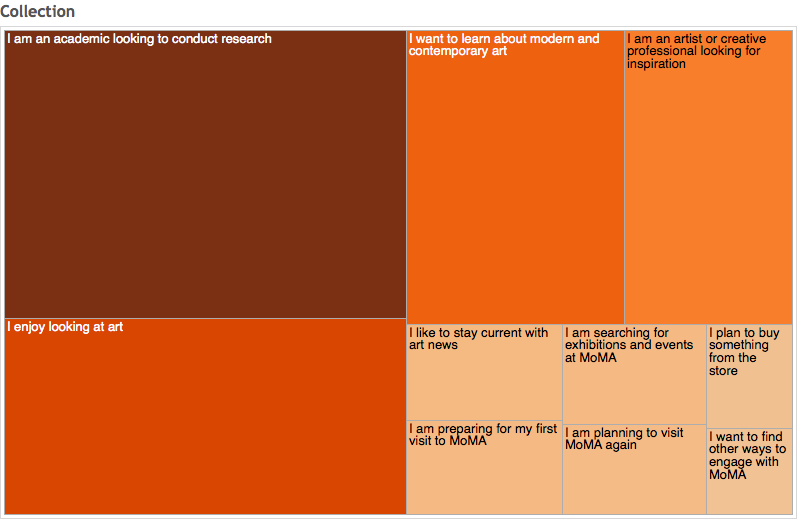 By contrast, people searching for exhibitions and events, or those interested in art news, report a high level of art knowledge and are much more likely than others to visit MoMA PS1. In summary, visitors to our collection come with research, learning, and aesthetic motivations. They report medium to high art knowledge and are likely to be professionally engaged with our subjects. They are frequent visitors to MoMA, engaged across a spectrum of activities. They’re the most likely to be interested in art news. Visitors to our calendar are predominantly NYC-based and likely to be members. They are engaged in the creative industries and report having a medium level of art knowledge. As you’d expect, our homepage sees more first-time visitors than any other section. Google Analytics suggests that there are twice as many new visitors as returning. This audience is younger and more international than the rest of the site, with a lower level of art knowledge. They’re the most likely to shop, particularly during the holiday season.